*Present address: Postgraduate School of Opto-Electrotechniques and Laser Applications, University of Indonesia, Salemba 4, Jakarta, Indonesia. 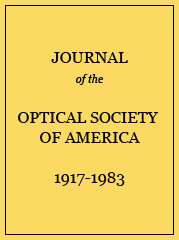 The dynamic statistical properties of laser speckle produced in the far-field diffraction region from a diffuse object moving longitudinally along the optical axis under illumination of a Gaussian beam are investigated theoretically and experimentally. Although the spatial structure of speckle patterns varies in time owing to the longitudinal motion of the object, the time-varying speckle intensity detected at the center of the far-field diffraction plane is found to follow a statistically stationary variation. The autocorrelation function and power spectral density of the speckle intensity variations are studied with relation to the illuminating condition of the Gaussian beam.